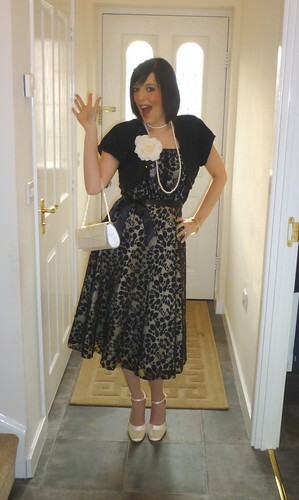 The Joy of Fashion: My Choice of Outfit of the week - Black and white retro feel! My Choice of Outfit of the week - Black and white retro feel! This week's outfit of the week goes to Sal from Candycane IS Married!! I love how Sal managed to make an all black and white outfit that still is interesting and awesome. Since I have a really hard time not incorporating colors into everything, I really admire people who can pull of an all black & white outfit. I think this dress looks beautiful on her and the perfect finishing touch was the big white floral brooch! Congrats on the nice outfit Sal! i just love this look. she looks very happy too!